5KFunds offers personal loans to borrowers with all credit types through a network of 100+ reputable partner lenders. Their freely accessible and no-obligation marketplace features loans ranging from $1,000 to $35,000 with interest rates starting as low as 5.99%. 5KFunds is a completely free personal loan comparison service that connects you with the best matching lender in their marketplace of 100+ authorized and vetted lenders. 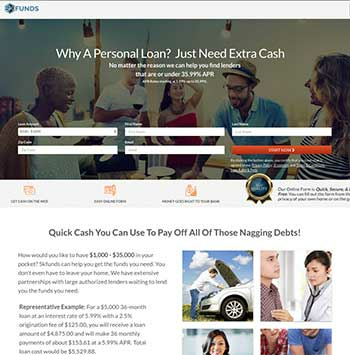 Their loan aggregation service is unique in the fact that there is no minimum credit score requirement to apply. 5KFunds' quick and easy application process is done 100% online. There is no initial credit check requirement and you only have to fill out a few fields of basic financial information. From there, pre-approval for loans takes as little as 90 seconds. You must have a steady stream of income. You must also have a bank account, preferably one with direct deposit. Once you pre-qualify, you are contacted by your lender to complete the process and negotiate your terms and conditions with them directly. Some lenders may perform a hard credit check at this time, which could lower your credit score. Depending on your income and loan needs, you may qualify for either a short-term loan or installment loan. APRs start at 5.99% and go as high as 35.99%. Loan amounts from 5KFunds partners range between $1,000 and $35,000 with loan terms from 61 days up to 72 months. 5K Funds provides friendly US-based customer service that can be reached by phone or email. Simple and 100% free application process: 5KFunds has a quick and secure application process which allows you to see the loans you pre-qualify for in minutes. No credit check required: The initial 5KFunds application process does not require a credit check (will not affect your credit score). Get your cash quickly: You can receive your funds via direct deposit quickly -- as soon as the next business day. Loan transparency: 5KFunds provides upfront and transparent information (loan terms and interest rates) about each potential loan to the customer. Reputable and vetted lending partners: Each lender in the 5KFunds marketplace is a reputable lender that meets responsible lending practices. Quality customer support: Customers positively reviewed 5KFunds' customer service and stated that their representatives were knowledgeable and answered questions thoroughly. Free financial education resources: 5KFunds provides an informative and educational FAQ section on their website. No collateral needed: 5KFunds only offers unsecured personal loans, which means you don't have to put up any collateral like your car or house. Information on the available lenders is difficult to find on their website. There is no live chat function for clients who have concerns that need to be addressed quickly. 5KFunds partners with a network of 100+ authorized lenders that provide online personal loans from $1,000 to $35,000. APRs range from 5.99% to 35.99%. Loan repayment terms range from 2 to 72 months. You can receive your funds as soon as the next business day. 5KFunds services are completely free of charge, although partner lenders will charge fees and/or interest that is clearly disclosed in the loan terms for your approval. There are no hidden fees or prepayment penalties. A personal loan is a large cash fund you can borrow for personal uses, like paying off consolidated debt, investing in your home, a vacation, or wedding. Can I use my personal loan for any purpose? Yes, you can use a personal loan from 5k Funds for any reason. 5KFunds' lending partners offer up to $35,000 in personal loans. Their lending process allows for borrowers with all credit types the opportunity to receive cash quickly, by having it directly deposited into their bank accounts as soon as the next business day. How much will a loan from 5KFunds cost me? 5KFunds' marketplace services are completely free, although your lender may charge you other fees in addition to your interest rates. However, your lender will let you know these costs before you sign up. If you have difficulty making your loan payments, make sure to contact your lender directly and as soon as possible to see if it can be rescheduled. Most lenders will charge an additional fee for a late payment. 5KFunds takes your privacy and security seriously; any personal information you enter is encrypted and protected.